E-health use is increasing worldwide, but no current e-health paradigm fulfills the complete range of users’ needs for Web-enabled healthcare services. Moreover, a number of obstacles exist that could make it difficult for e-health to meet users’ expectations, especially in the case where the users are patients. These dilemmas cloud the future of e-health, as promoters of e-commerce, personal health records, and consumer health informatics paradigms vie to create e-health applications while being hampered by the implicit constraints of each perspective. 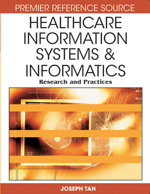 This chapter presents an alternative approach for designing and developing e-health titled personal health informatics (PHI). PHI was developed to overcome the limitations of preceding paradigms while incorporating their best features. The chapter goes on to describe how PHI can be applied to create effective patient-centered e-health for delivery by healthcare organizations to their own patients.